I’m having a vintage tea party phase at the moment. I’ve got my mum rummaging through Cornish charity shops and car boot sales looking for pretty vintage crockery. I never seem to find any good stuff in London, and she picks up some great pieces at bargain prices. 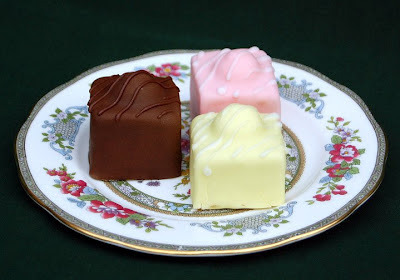 I’m also trying out some ‘vintage style’ cakes, and this week’s effort was French fancies. I must admit that I’m not a huge fan of these (too much icing for me), but the kids absolutely love them, and my home made version was a bit hit. They look great on my new ‘Tree of Kashmir’ plate (thanks Ma!). A good old fashioned battenburg next I think, or maybe a a bakewell tart. I loved these when I was a kid – the icing was the best bit. Yours look really good – I'm getting a serious case of nostalgia. Goodness those fancies of yours look amazing and just like the "real" thing. Gorgeous plate too – might just have to go into competition with your mother!!! Oh no you mustn't do that, you have the same stomping ground! The only trouble is that I'm the only one in the house who eats marzipan, and will therefore end up eating the lot. Will have to drop some round for you! Thanks Phil. They're a bit of a pain to make, but I'm glad I tried them. What a lovely blog you have…these look amazing.Oh one day I will try to make these. So happy to have found you.